El mejor lugar para estar durante todo el año y para toda la familia y amigos. Esta es una casa de playa totalmente equipada con 4 dormitorios y 5 baños con capacidad para 14 personas. Es un espacio social moderno, minimalista y abierto, para que todos disfruten. Puede disfrutar de las mañanas con un buen desayuno en el balcón privado de nuestro dormitorio principal frente al océano. Luego descansa en la palapa del patio delantero para el almuerzo o la cena. ¡También tu cancha de voleibol solo para ti mantendrá tu sangre fluyendo! Una piscina justo en frente de la casa frente al mar con una gran zona de barbacoa abierta para comer día y noche, tomar el sol y / o karaoke de entretenimiento. Nuestro personal se ocupará de usted ya que lo alquilaría (opcional) con ayuda para la limpieza y la cocina y otro miembro del personal para el trabajo externo. Esta es la primer casa que disponemos frente a la playa. Es muy difícil no enamorarse de este pequeño pueblo. Es fantastico ! Es el segundo verano que disfrutamos de la casa en el verano y la verdad es difícil despedirse de ella. Son muchas memorias extraordinarias de la familia que se construyen dia a dia en esta casa. Si quiere relajarse. Tiene el espacio y el momento para hacerlo. Si quiere ir de paseo al centro historico de Merida, esta a solo 30 minutos en carro. Para ir de compras a los mejores centros comerciales. Si desea visitar atracciones turísticas están muy cerca. Es un lugar que lo tiene todo. Cada habitación tiene un baño de ducha / WC. También disponemos de un medio baño para el área social. Esta es la villa de pescadores; justo en el centro de la ciudad por lo que tiene acceso a la plaza principal con sólo caminar dos cuadras. Es justo en frente de la playa en una esquina, así que tiene acceso a la casa con su coche para aparcar en la parte de atrás de la casa y sólo a pie de la playa en frente de la casa. Es una experiencia muy agradable para comer la pesca del día y ver el sol sale por la mañana y la puesta del sol de la tarde. Impresionantes vistas. We stayed here January 24th- Feb.2 2019. This home was very clean and had everything we needed for or stay. Miguel, was always there when we run into some questions and filled our water and gas. 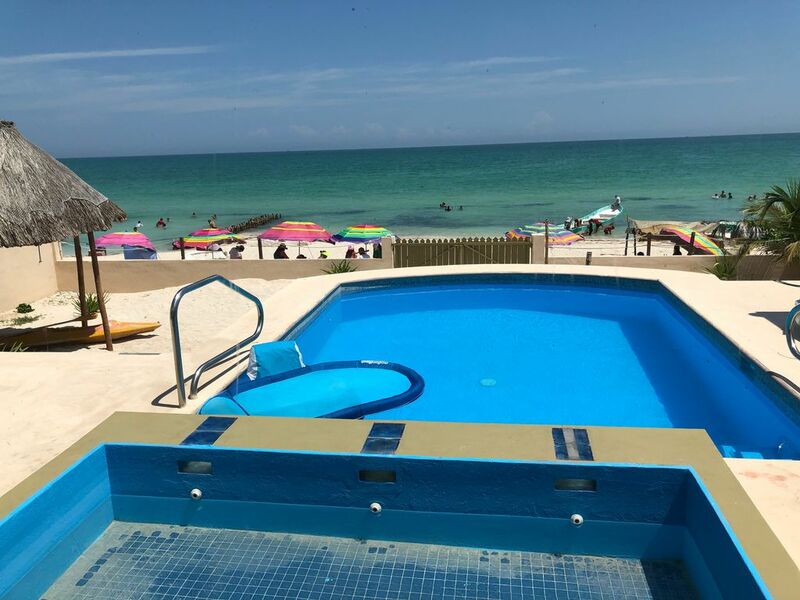 This home is very close to town, which we could walk a short distance to restaurants groceries, and the shuttle to Progreso. I would suggest flying into Merida. Saves time on your travel days. Thank you Omar for sharing your home with us. Great house on the beach in Chelem. Although we had a few minor issues, Miguel was only a phone call away and was always helpful. Waking up to the ocean and enjoying the pool and private sandy backyard was amazing. If you want a quiet vacation in a very friendly town.....this is a great choice! Omar the host was great at communicating and always responded promptly. Loved our time there. A vacation we will always remember. Thank you Omar! Simply authentic and great! Basic life, full of pleasures. Our 10 days familly holidays in Chelem at Omar's home is hard to forget, so it is to get back to winter in Canada. First, the house is exactly as shown on pictures. No surprise. Of all homes rented over the years, it was the most furnished kitchen I ever had. Having access to a juice extractor and pots, to tuppewares of multiple sizes and a blender faciliated enjoying day to day life: Fresh orange juice in the morning, pina colada and margarita, snack and cut fruits on the road, left overs.... Other special attentions are the number of chairs and hammock outside. Also, being able to connect our portable devices to the speaker enabled dance around the pool, on the beach.. in the house. Miguel was showing up every to check the house, ensuring eveything was fine . He was quite efficient at solving small issues ( need for additional sheets, gaz tank empty, crash course on how to light the oven....). We miss you Miguel. Chelem people are very kind and welcoming. We miss all these smiles, the daily Buenas dias. Meeting the fishermen and getting catch of the day was quite the highlight of the trip. Manuel is able to catch the best robalos ! I truly recommend this place. A small town with fresh and local fish, coconut pies (a must), tortillas..., far from stress and articifial life, close enough to Progreso for larger and specific needs and to outdoors activities (Maya sites, cenotes, flamingos...). Thanks Omar for having getting us the chance to discover this great place! Isn't it a great place to be? You capture in your words the essence of our beach house and most of all the nature of being at Chelem. Nature, simplicity and an authentic Mexico that has been lost in some other touristic places. I hope you make it back some time in the future! My wife and I will try to keep this house the best way possible ! Congratulations on your 30th anniversary ! We are very happy you had a great time in our beach house. It is as you say, a nice place to have a simplistic, cultural and family oriented vacation. You are a wonderful family and we would be delighted for you to come back anytime ! Charming villa, true hospitality, $$$ views! Western style villa with all that you need to have great times. Omar and his team cared about us all the way from picking us up after midnight in Merida to dropping us off at the ADO bus station in Merida on the way back. I would recommend it to anyone. Thank Omar so much! Amazing Home on the Beach! We can't thank the Gonzales family enough for renting us their ocean front home for the month of January, 2015! We're just on our last couple days here now and would certainly recommend this property with a full 5 stars! The home is one of the nicest in Chelem and offers an excellent floor plan layout. We loved the kitchen that was stocked with everything we needed and offers tons of granite countertops including a large island with 6 highback chairs. The two main floor bedrooms are like dual masters with full ensuites and ocean views and we loved the breeze that flowed off the ocean each evening. All 4 bedrooms offer their own bathrooms and there is also a powder room off the main living area. We had great weather throughout the month with average temps being 80F and the house stayed at a comfortable 70-72F without any air, just a nice breeze off the ocean. The entire home is gated and fenced and we certainly felt very safe here too. All the people here in Chelem and Progresso were VERY friendly both day and night and we were always greeted with smiles and hellos where ever we went. The pool was refreshing on the hotter, full sun days and the entire main floor is perched above the main beach to provide excellent views and there was always an ample amount of sun and shade if required. We hosted some friends here for a week during the month and they really enjoyed themselves too. We made some friends with the local fisherman that moored their boats next to the property and we had a fresh supply of fish and lobster that we enjoyed almost daily! I'd recommend the fish & lobster from the market just two blocks up the road; Fresh Daily! We are very happy that you enjoy your stay in our house at Chelem. You will always be welcome to come back to Chelem any time !